Rachel Mitton-Fry, a biochemist, is interested in structure-function relationships in non-coding RNA elements. Current work in the Mitton-Fry laboratory focuses on RNA thermosensors, RNA elements that affect gene expression levels in response to temperature variation. The past decade has seen explosive discovery of non-coding and structural RNAs in biological systems. Full understanding of these RNA molecules requires detailed characterization of their structures and dynamics. Current efforts in the Mitton-Fry laboratory focus on study of structure-function relationships in a class of RNA elements known as RNA thermosensors. These elements, most commonly found in the 5´-untranslated region (UTR) of bacterial genes, adopt temperature-sensitive structures that affect gene expression levels in response to temperature variation. No protein cofactors have been found to be required for thermosensor function. Most known thermosensors regulate translation of proteins involved in heat or cold shock responses or in pathogenic virulence. My lab seeks to characterize RNA thermosensors using a variety of biochemical and biophysical means, with the goal of greater understanding of the determinants for thermosensor function in biological systems. I have strong commitment to working with undergraduates on this research, both in the summer and throughout the academic year. Steitz, J.; Borah, S.; Cazalla, D.; Fok, V.; Lytle, R.; Mitton-Fry, R.; Riley, K.; Samji, T. Noncoding RNPs of viral origin. Cold Spring Harb. Perspect. Biol. 2011, doi: 10.1101/cshperspect.a005165. Mitton-Fry, R. M.; DeGregorio, S. J.; Wang, J.; Steitz, T. A.; Steitz, J. A. 2010. Poly(A) tail recognition by a viral RNA element through assembly of a triple helix. Science, 330, 1244-1247. Steitz, J.; Borah, S.; Cazalla, D.; Fok, V.; Lytle, R.; Mitton-Fry, R.; Riley, K.; Samji, T. 2010. Noncoding RNPs of viral origin. Cold Spring Harb. Perspect. Biol,. doi: 10.1101/cshperspect.a005165. Fok, V.;‡ Mitton-Fry, R. M.; ‡ Grech, A.; Steitz, J. A. 2006. Multiple domains of EBER 1, an Epstein-Barr virus noncoding RNA, recruit ribosomal protein L22. RNA, 12, 872-882. ‡Equal authorship. Mitton-Fry, R. M.; Anderson, E. M.; Theobald, D. L.; Glustrom, L. W.; Wuttke, D. S. 2004. Structural basis for telomeric single-stranded DNA recognition by yeast Cdc13. J. Mol. Biol., 338, 241-255. Theobald, D. L.; Mitton-Fry, R. M.; Wuttke, D. S. 2003. Nucleic acid recognition by OB-fold proteins. Ann. Rev. Biophys. Biomol. Struct., 32, 115-133. Glustrom, L. W.; Mitton-Fry, R. M.; Wuttke, D. S. 2002. Re: 1,1-Dichloro-2,2-bis-(p-chlorophenyl) ethylene and polychlorinated biphenyls and breast cancer: combined analysis of five U.S. studies. Reviewed letter. J. Natl. Cancer Inst., 94, 1337-1338. Mitton-Fry, R. M.; Anderson, E. M.; Hughes, T. R.; Lundblad, V.; Wuttke, D. S. 2002. Conservation of structure for recognition of single-stranded telomeric DNA. Science, 296, 145-147. Mitton-Fry, R. M.; Wuttke, D. S. 2002. 1H, 13C, and 15N resonance assignments of the DNA-binding domain of the essential protein Cdc13 complexed with single-stranded telomeric DNA. J. Biomol. NMR, 22, 379-380. Ojennus, D. D.; Mitton-Fry, R. M.; Wuttke, D. S. 1999. Induced alignment and measurement of dipolar couplings of an SH2 domain through direct binding with filamentous phage. J. Biomol. NMR, 14, 175-179. Norris, J. W.; Fry, R. M.; Tu, A. T. 1997. The nucleotide sequence of the translated and untranslated regions of a cDNA for myotoxin a from the venom of prairie rattlesnake (Crotalus viridis viridis). Biochem. Biophys. Res. Comm., 230, 607-610. American Chemical Society 251st National Meeting, San Diego, CA, March 2016 (poster presentation). Nucleic Acids Gordon Research Conference, Biddeford, ME, June 2015 (poster presentation). Invited speaker, University of Maryland-Baltimore County, Department of Chemistry and Biochemistry, Baltimore, MD, April 2015. Nineteenth Annual Meeting of the RNA Society, Quebec City, Canada, May 2014 (poster presentation). American Chemical Society 246th National Meeting, Indianapolis, IN, September 2013 (poster presentation). *Choi, E. K., Mitton-Fry, R. M. “Analyzing the role of G•U base pairs on the melting behavior of the S. enterica htrA RNA thermometer.” Poster presentation at the 2017 Rustbelt RNA Meeting, Indianapolis, IN, October 2017. Presentation received the Excellent Undergraduate Poster Presentation Award. *Tan, Y. Y., Mitton-Fry, R. M. Investigating the importance of the bulge region for S. enterica htrA RNA thermometer behavior using SHAPE assays. Poster presentation at the 2017 Rustbelt RNA Meeting, Indianapolis, IN, October 2017. *Nguyen, Y. A., Mitton-Fry, R. M. Monitoring htrA RNA thermometer activity using a - galactosidase assay in Escherichia coli. Poster presentation at the American Chemical Society 253rd National Meeting. San Francisco, CA, April 2017. *Choi, E. K., Mitton-Fry, R. M. Structural studies on the Salmonella enterica htrA RNA thermometer using SHAPE analysis. Poster presentation at the 2016 Rustbelt RNA Meeting. Cleveland, OH, October 2016. *Nguyen, Y. A., Mitton-Fry, R. M. Monitoring htrA RNA thermometer activity using a - galactosidase assay in Escherichia coli. Poster presentation at the 2016 Rustbelt RNA Meeting, Cleveland, OH, October 2016. *Cempre, C. B., *Ulanowicz, K. A., Mitton-Fry, R. M. SHAPE analysis of the rpoH thermosensor from Escherichia coli. Poster presentation at the 2014 Rustbelt RNA Meeting, Pittsburgh, PA, October 2014. *Ulanowicz, K. A., *Cempre, C. B., Mitton-Fry, R. M. Structure probing of the htrA RNA thermometer from Salmonella enterica. Poster presentation at the 2014 Rustbelt RNA Meeting, Pittsburgh, PA, October 2014. *Cempre, C. B., *Ulanowicz, K. A., Mitton-Fry, R. M. SHAPE analysis of a potential RNA thermosensor in Salmonella enterica. Poster presentation at 2013 Rustbelt RNA Meeting, Cleveland, OH, October 2013. *Frandsen, J. K., *Cornell, H. K., Mitton-Fry, R. M. Biochemical investigation of a potential RNA thermometer in Enterobacter cloacae. Poster presentation at the 2013 Rustbelt RNA Meeting, Cleveland, OH, October 2013. *Ulanowicz, K. A., *Cempre, C. B., Mitton-Fry, R. M. Characterization of a hypothetical RNA thermometer in Enterobacter cloacae using SHAPE analysis. Poster presentation at the 2013 Rustbelt RNA Meeting, Cleveland, OH, October 2013. Denison students present at a professional conference, thanks to Associate Professor of Chemistry Rachel Mitton-Fry. 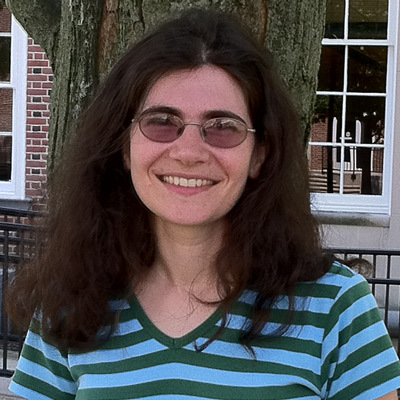 Denison University announces newly tenured professors.